Trialling a new qualifying format at the Waikerie Hotel ARB Riverland 300 proved interesting with movement at the top end of the field. 20 of the 70 starters chose the option to have a second attempt at the 11km prologue track. The gotcha; they had to forfeit their original prologue time. Some teams used the first run as a warm up which was evident by their much faster second run; other teams took the gamble and lost. Results after the first run had Raana Horan and Klem Christiansen #89 at the top of the tree and Aaron James and Peter Luckraft #93 in second place, Talbot Cox and Andrew North #16 in third. Horan and Christiansen, after seeing most of the front runners nominate for their second attempt, felt that their 3second lead wouldn’t hold up and put it all on the line for a second attempt. Unfortunately they were caught in their own dust and clocked in a 5second longer second prologue time over their first landing them in fourth place. The winner for the day was hard charging Aaron James and Peter Luckraft #93 who bettered their time by over 9 seconds to sit on pole position for Sunday’s 9am start to the Waikerie Hotel ARB Riverland 300. Scott Schiller and Nathan Schultz #971 suffered overheating issues and failed to finish their first attempt but came out guns blazing to slot into second place behind James. North Queensland entrant and round one outright winner Talbot Cox and Andrew North #16 bettered their first time by 1.3seconds to maintain their third position come race day. Greg Gartner and Jamie Jennings #410 slightly improved their time – 0.81seconds – but dropped back one position to fifth. 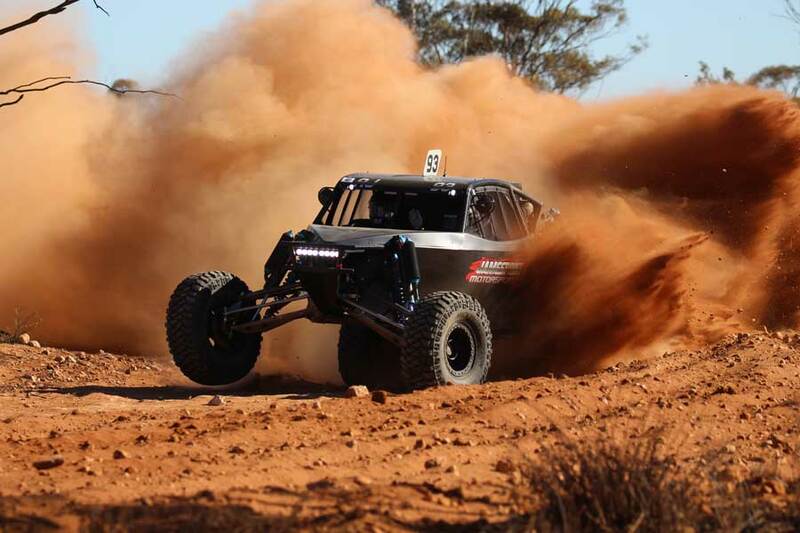 Current ARB Australian Off Road Racing Championship points leaders Brent Martin and Jimmy Boyle moved the #120 Jimco from 27th place up to tenth, clocking in a 31.8seconds quicker time; the best improver for the day and one would think a strategy well played. Racing gets underway at 9am tomorrow with one at a time 20 second interval starts. Teams will encounter 5 laps of the 65km course before they greet the checkered flag. Live results will be available via offroadracing.com.au throughout the weekend.